Finishing up our assignment in Christchurch, New Zealand we conducted over 45 interviews and met with city leaders, entrepreneurs, venture capitalists, construction companies, startups and students to identify new ways to make the city smarter and more effective as it rebuilds from a devastating series of earthquakes. This video blog captures just some of our impressions and from our time in Christchurch. Our overall findings will be delivered to the city in a formal report next month. Broadcasting live from Christchurch New Zealand – join Caleb Barlow, Luciana Camargo, John Fennell, Drew Clark, Stephen Dill and Erick Brethenoux on a special assignment as part of the Smarter Cities Challenge. The city of Christchurch recently suffered a series of earthquakes which caused massive damage in the central city and some suburban areas along with the death of 185 people. Most of the central city area is unusable as nearly 70% of commercial buildings are scheduled to be demolished. In the next 10 years, an estimated $40 billion will be invested in rebuilding and renewing Christchurch. This team of 6 IBM executives are on the ground in Christchurch working with city leaders, investors, students and innovators to provide recommendations on how to make the city smarter and more effective. The opportunity here is simply amazing – a high quality of life, easy access to the outdoors, a well educated English speaking workforce and a growth in GDP that already rivals China and they are just getting started. In this podcast we talk about the incredible opportunity for entrepreneurs, innovators and investors in the coming years in Christchurch as it rebuilds. This is Drew Clark, SCC Christchurch team member. 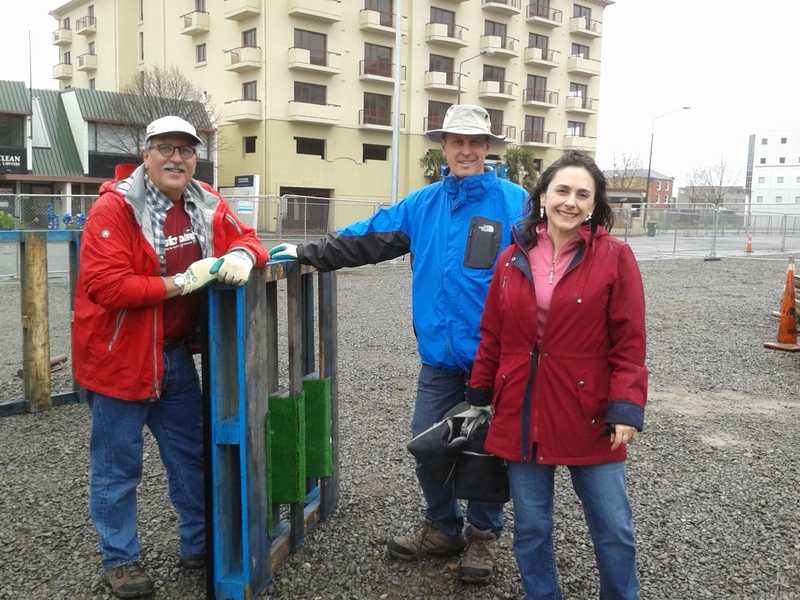 It’s Saturday and raining here in Christchurch, perfect weather for the Smarter Cities Challenge team to head down to the Gap Filler HQ and Pallet Pavilion (more about this in a minute) for some good old fashioned roll-up-your-sleeves volunteer project work. Like many things happening in Christchurch these post-earthquake days, Gap Filler is a for-the-people-by-the-people initiative whose mission is to literally fill the gaps left by fallen and deconstructed (yes, that’s a word) buildings. In many of these now vacant spaces, Gap Filler has erected – through an all volunteer labor of love – dozens of artful yet practical community spaces where people can engage with live music, food and treats, performance & other events, city-wide mini golf, repurposed appliances such as washing machines that play music, and other assorted fun activities. So off we went, down to the GF pavilion to see what needs doing there. 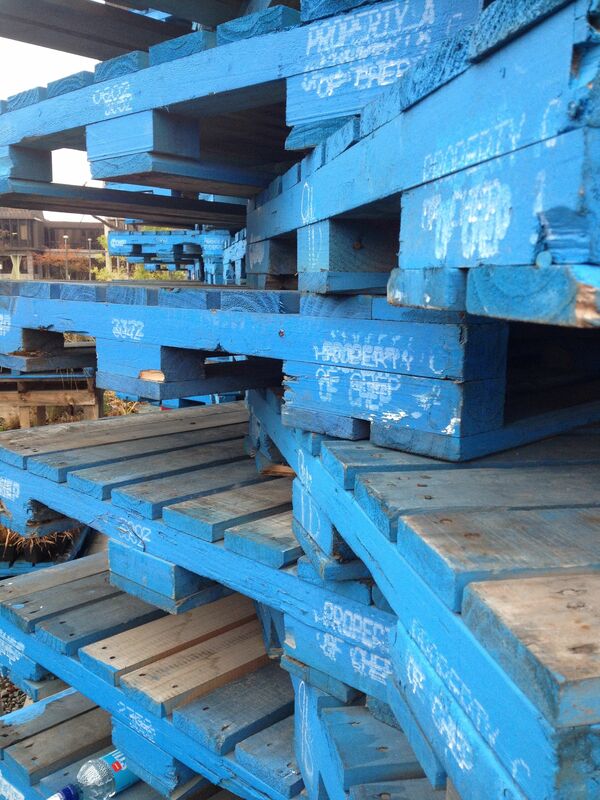 It’s called “Pallet Pavillion” because, well, it’s made up entirely of hundreds of stacked wooden shipping pallets, all painted – in this case, a striking blue color. Given that there’s a seemingly endless number of projects that need doing there, we had no trouble getting right to work on something interesting: taking apart and carefully separating (for proper recycling) a lovely old wooden standup piano that had somehow made it’s way to the GF site. Fresh from breakfast and full of energy, the team dispatched the sad-looking instrument in short order, sorting all of the wood, metal and other materials into their respective bins and containers for repurposing and reuse. Next up was another interesting challenge: using repurposed materials on hand, design a simple and easy-to-use bike rack to encourage Pavilion visitors to come by bike,and hopefully setting a good example for other urban travelers. Natch, we looked to the seemingly endless number of pallets available as our base platform, and whipped up this utilitarian but robust design that we believe will perform well in this task. Note especially our custom astroturf bumpers that will protect wheels and fenders while securely parked in our stand. 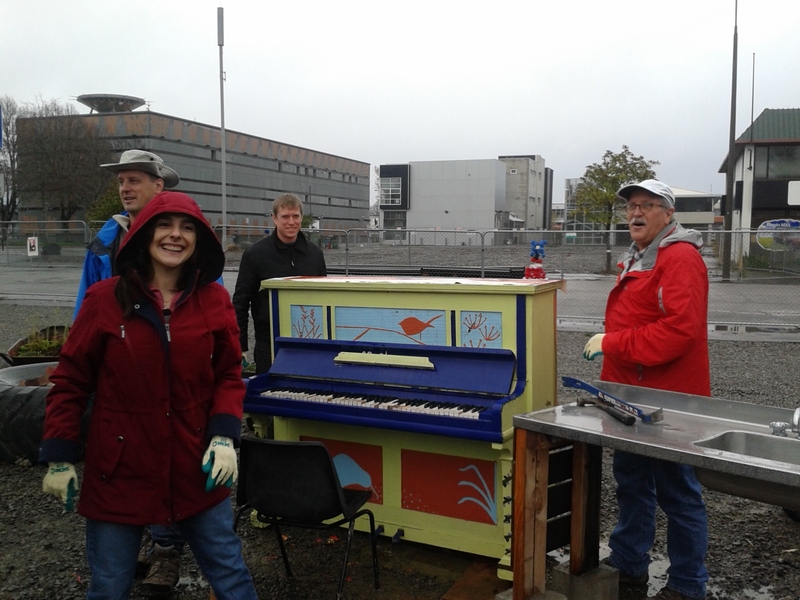 Alas, after 2 bike stands complete and piano sorted, it was time for the team to move on. All agreed that we felt we had accomplished something special for Gap Filler and Christchurch, but it wasn’t really anything physical we’d built or taken apart. It was in helping to fill the emotional gap that the people of Christchurch feel among the fallen buildings and empty spaces that once were the heart of a vibrant city. By filling these spaces with art, music, and fun, these gaps begin to close and are replaced with rich new experiences that bring people and city back together as well. Downtown Christchurch is still mostly closed, as 70% of the buildings are being demolished from earthquake damage and the rebuild has barely begun. However, one of the first buildings to be built and open is the EPIC “Sanctuary,” a start-up community in the new “Innovation Precinct” in Christchurch. This warehouse-like building opened late last year, and is a large timber-frame building that houses seventeen high-tech companies. It’s quite an interesting building, designed as a temporary space for five years and made from locally-sourced laminate veneer lumber. I wonder if they’ll physically take down and move the building at that time, though the tenants seem pretty confident that they will be there longer than five years. You can take a virtual tour of the building on Google Street View. We got a tour from their anchor tenant, SLI Systems, a company that specializes in site search and user generated SEO. They have customers and data centers all over the world, but house key engineers and head office here in Christchurch. There are also over a dozen other high-tech companies hosted in the EPIC building, many startups or small engineering consultants. Our visit coincided with a Coffee and Jam event, which is hosted every Tuesday afternoon by the Ministry of Awesome as a way to bring people together for presentations and discussions. The first speaker was from PowerHouse, an IP commercialization company that uses public and private investment to fund ventures — clearly a topic that would be of interest to the startups in the community. The second was from a local startup that was looking at peer-to-peer crowdsharing produce, and was an opportunity for them to share their ideas with the local technical community and get feedback. They also provided time for people to just speak up to the larger community — one was a pair of software developers looking for mentors, and the other from a Chinese immigrant who was offering to help companies interested in importing from China. This tour was a great indication of the creativity and promise of new Christchurch! Running down a narrow river at 90 Km/h (55 mph), sheering a sheep, bathing in sulphur pools, after enjoying a gourmet meal, and stopping by to taste a delicious Riesling (among other wonderfully crafted cuvées) at a renowned winery on the way back to the city is also part of the research one has to undertake to thoroughly understand the culture. Not to mention witnessing breathtaking natural sceneries not even 30 kms (20 miles) apart – from the snowed in mountain tops an hour and a half away (now open for skying) to the Pacific Ocean, 15 minutes away. There is no doubt that despite the backdrop of the tragedy Christchurch remains one of the most privileged places in the World. 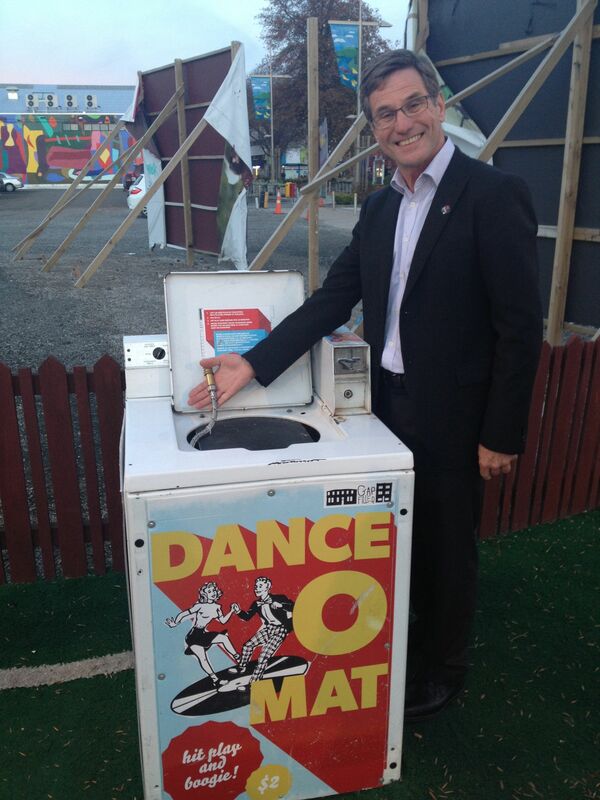 Quality of life is not just a slogan in Christchurch, it is a way of life. The single word I would use to describe the primal quality of everything we are experiencing is: authenticity. The most unassuming fish dish at a local pub turns into a top quality meal you would expect at top restaurants in most renowned cities worldwide, from Paris to New York through Sao Paulo, and the principal reason is always the same, around the World, the quality of a great “plat” is first dictated by the quality of its raw ingredients; and New Zealand has those ingredients in abundance. We are now entering our second week in Christchurch and starting to develop some key themes on how we can assist the city as it goes through its rebuild and transition process. In the previous week we met with many people each of who had strong views on what was needed to develop a sustainable and economically prosperous city. Like any large scale change there are many opinions about how to approach the challenge but a single view coming through is that change is essential and in many cases inevitable. Education was a key theme. We met with people who are passionate about ensuring that the education process supports the community’s needs and gave the individual student the skills to compete and contribute to society. There was also the understanding that learning is a life long process that the education system has to support. We met with many people who had left Christchurch as they graduated from university and had now returned. The common theme is that Christchurch is a great place to rear and educate their children. Also we met many migrants that had married people from Christchurch overseas and had settled in Christchurch for the same reason. This presents Christchurch with an influx of talent gives it leverage for developing new and existing businesses and cultural change. There was a lot of talk about innovation being a way of creating economic advantage. It was clear that a great many inventions and products had come from this region but had been productised and developed overseas due to lack of venture capital or distance from the market. There is a diverse range of views on what is innovation and the best way to foster it. Over the weekend we took a tour around the Red Zone which is the areas worst affected by the earthquake. We saw streets where all the houses were either destroyed or were unliveable. We saw walls that are supported by shipping containers. Although many houses have been repaired there is a long way to go. Everywhere we went there were street blockages as teams repairing water and sewage services moved through. We were told that any trip around the city is unpredictable due to the constant road closures and repair work. At a personal level many people we meet are still traumatised by the earthquake and the going recovery efforts. Everyone has a story about what happened to them and their families on the day of the quake. Also nearly all have damaged homes that in many cases have not been repaired so it can be difficult to focus on the bigger picture of city recovery. Today was our first day on the ground as a #smartercities challenge team in Christchurch NZ. Since Sept of 2010 the city has been impacted by multiple devastating earthquakes that not only resulted in a loss of life but a near total destruction of the center of the city where approximately 70% of commercial buildings will have to be demolished. As we toured the “red zone” this one picture I took really captured the essence of life in Christchurch. A vibrant city life with shops, restaurants and life getting back to normal but the scars of the earthquakes are ever present in the background.